1. Heat 1 tbsp oil in a saucepan over a medium heat. Fry the garlic for 30 seconds; add the beans and a pinch of salt. Cook for 2-3 minutes then take off the heat. Add a splash of the lemon juice and a grinding of black pepper; mash with a potato masher. Stir in the artichoke purée and add a splash of water to loosen if needed. Set aside; cover to keep warm. 2. Meanwhile, heat ½ tbsp oil in a large frying pan over a high heat. Add the spinach and fry, stirring, until wilted and any excess liquid has evaporated. Add a little of the lemon juice and season to taste, then divide between 2 plates. 3. Wipe out the pan and return to a medium-high heat. Pat the fish dry with kitchen paper; season. Add the remaining ½ tbsp oil to the pan and fry the fish skin-side down for 3 minutes. Turn the fillets over, add the remaining lemon juice and cook for 2-3 minutes more. 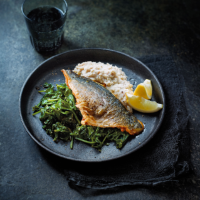 Serve at once with the mash, spinach and extra lemon wedges for squeezing over. You could make the mash with a different pulse, if you like – perhaps a 400g can of chick peas (drained first), or some flageolet or butter beans. This recipe appeared within the January 2019 recipe card collection.